HENRY FONDA in "On Golden Pond", Warren Beatty in "Reds", Burt Lancaster in "Atlantic City", Dudley Moore in "Arthur", Paul Newman in "Absence of Malice"
KATHARINE HEPBURN in "On Golden Pond", Diane Keaton in "Reds", Marsha Mason in "Only When I Laugh", Susan Sarandon in "Atlantic City", Meryl Streep in "The French Lieutenant's Woman"
JOHN GIELGUD in "Arthur", James Coco in "Only When I Laugh", Ian Holm in "Chariots of Fire", Jack Nicholson in "Reds", Howard E. Rollins, Jr. in "Ragtime"
MAUREEN STAPLETON in "Reds", Melinda Dillon in "Absence of Malice", Jane Fonda in "On Golden Pond", Joan Hackett in "Only When I Laugh", Elizabeth McGovern in "Ragtime"
WARREN BEATTY for "Reds", Hugh Hudson for "Chariots of Fire", Louis Malle for "Atlantic City", Mark Rydell for "On Golden Pond", Steven Spielberg for "Raiders of the Lost Ark"
The Best Picture winner this year was a surprise and major upset win for British producer David Puttnam's low-budget Chariots of Fire, directed by Hugh Hudson, with seven nominations and four wins. It also took top honors for Best Screenplay (Colin Welland), Best Original Score (Vangelis' rich electronic, throbbing score, especially during the iconic opening credits sequence) and Best Costume Design. 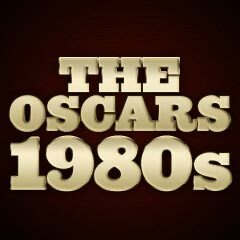 The win signaled the start of another mini-British renaissance of film awards for this year and the next - with Gandhi (1982) soon breaking all British film Oscar records. (It had been 13 years since another British-made film had won Best Picture, Oliver! 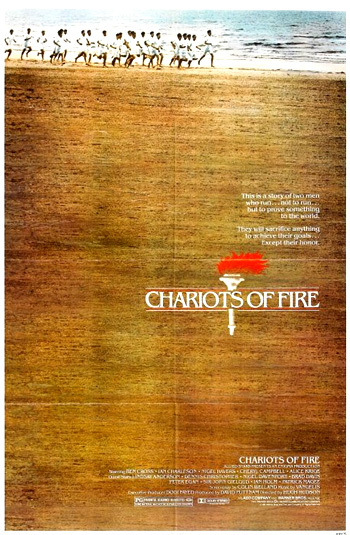 (1968)) Chariots of Fire was also the second sports film to win Best Picture (the first was Rocky (1976)). It also marked the first of four biopics to win the top award during the 80s, joining Gandhi (1982), Amadeus (1984), and The Last Emperor (1987). Katharine Hepburn as his wise and quietly-strong wife Ethel who urges her crusty husband to reconcile with his daughter (Jane Fonda) in On Golden Pond. The couple portrayed bickering but devoted protagonists. [At 74 years of age, Hepburn became the oldest Best Actress winner up to that time - she was surpassed 8 years later by 80 year old Jessica Tandy for Driving Miss Daisy (1989). Hepburn also set a record with her fourth (and final) Oscar - she became the first performer to win that many Best Actress awards with a record of twelve nominations. Four-time Best Actress Oscar-defeated Barbara Stanwyck (in 1937, 1941, 1944 and 1948) accepted an Honorary statuette from the Academy, "for superlative creativity and unique contribution to the art of screen acting." Director John Boorman's visionary version of the King Arthur tales - Excalibur, received only one unsuccessful nomination for Best Cinematography. The four nominations for The Rose, featuring Bette Midler's remarkable performance, went unhonored. The endlessly fascinating dinner conversation film, Louis Malle's My Dinner With Andre was completely omitted from honors. There were no special recognitions or nominations for the imaginative Visual Effects in the mythological fantasy Clash of the Titans, the last film from legendary stop-motion animator Ray Harryhausen. Ragtime was awarded eight nominations (with no wins) without a Best Picture nomination. And Gallipoli went completely unnominated, including omissions for Best Picture, Best Director (Peter Weir), Best Actor (Mel Gibson), and Best Supporting Actor (Bill Hunter). Director Blake Edwards' semi-autobiographical comedy S.O.B., a satire on the film industry which featured his squeaky-clean wife Julie Andrews exposing her breasts, was devoid of nominations, as was the crime drama True Confessions, starring Robert Duvall and Robert DeNiro as two brothers brought together as a result of a brutal murder in late 1940s Los Angeles.